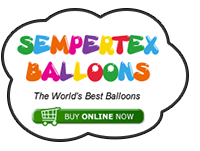 Inflate the Sempertex 26o modelling balloon so that you have a 4 finger length un-inflated at the tail end. Twist a 4 finger bubble for the head, a 1 finger bubble for an ear that is ear/pinch twisted. 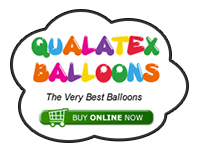 To do this fold the head against the rest of the balloon and gently pull away the 1 finger bubble while twisting approx 4 times to make sure it will not come undone. Twist another 1 finger bubble for the other ear and repeat the process for twisting the ear. This will be twisted against the first ear so take your time & gently twist in the second ear. The neck needs to be approx between 10/12 fingers in length followed by two 5 finger bubbles for the front legs that are twisted around the bottom of the neck. The body is a 4 finger length bubble with two more 4 finger bubbles for the back legs twisted around the back of the body bubble. Hopefully this will leave you with a 2 finger tail bubble, if you find that you have more left over or not enough balloon then just change the size of the neck bubble to compensate for this. The front legs on the giraffe should be longer than the back, this is done intentionally as a giraffe does have longer front legs. Very nice!! A little twist to this is to do a loop twist at the nose. This creates a rounded area to draw a mouth and small dots for the nose itself. Also, once you have a little more experience, add a mocha 160. Twist a 1.5cm bubble followed by two one cm bubbles and a matching 1.5 cm bubble lock them together by wrapping the nozzle round and pushing it through between the bubbles. Twist these bubbles around the ears of the giraffe and then start twisting a long string or 1cm round bubbles from the back of its head down its neck to the join where the neck meets the front legs. Make just enough bubbles to reach that joint and then wrap the 160 around the join. Squeeze the air out as you wrap the remainder around your fingers, snap or cut off the end and tie it securely. Cut off any excess. Would you be able to post a picture of the variation? Thanks.